Two Blue Moons in one year seem to belie idea that once in a Blue Moon indicates something rare. It’s true that, in recent years – with more than one definition for Blue Moon – Blue Moons seem to happen pretty often. 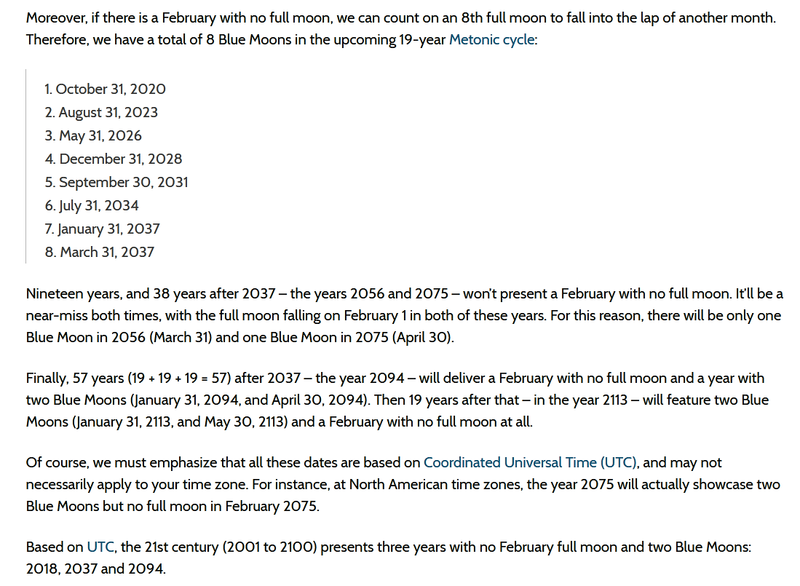 Yet it’s indeed quite rare to have two Blue Moons in a single calendar year. It last happened in 1999 and won’t happen again until 2037. Skywatchers take note: The last Blue Moon of 2018 is just around the corner. 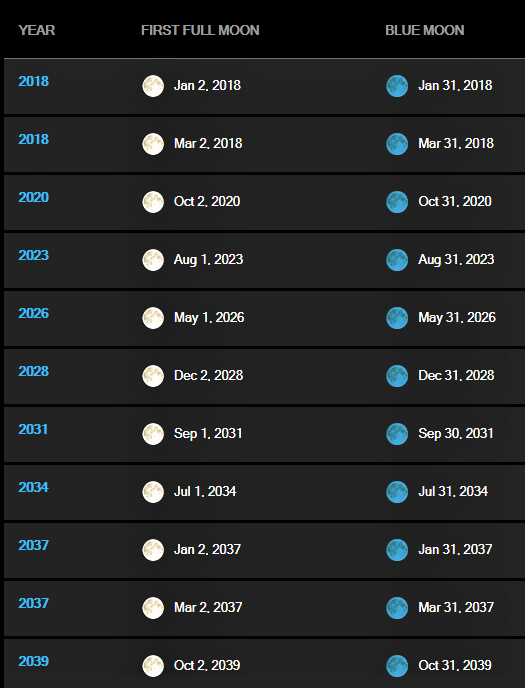 If you miss it, you'll have to wait to 2020 for the next one. The upcoming Blue Moon — the name given to the second full moon to occur in a single calendar month — rises on Saturday (March 31). It'll be the second Blue Moon of the year; the first occurred on Jan. 31, when we experienced the "Super Blue Blood Moon Lunar Eclipse." If you're a Blue Moon fan, make sure to get an eyeful on Saturday; the next one won't come until Halloween night in 2020, according to the Weather Channel. But Blue Moons aren't all that rare, really: On average, they occur about once every 2.7 years. 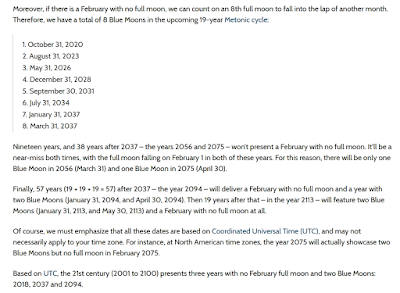 Blue Moons are possible because it takes Earth's nearest neighbor 29.5 days to circle our planet, but each calendar month (except February) contains 30 or 31 days. The month of March opens and closes with a full moon this year, making this the second "Blue Moon" month in 2018. The moon first became full on Thursday, March 1, at 7:51 p.m. EST (0051 GMT) and will again on Saturday, March 31, at 8:37 a.m. EDT (1237 GMT). The first Blue Moon of 2018 was the spectacular Super Blue Blood Moon of Jan. 31. Not every month gets two full moons. 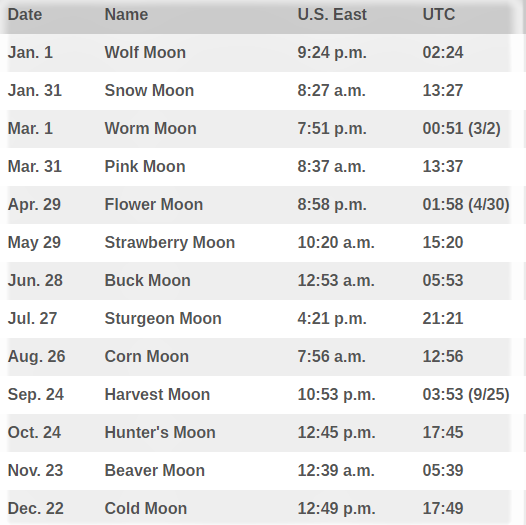 The time between full moons (known as a synodic month) averages 29.53 days, so we usually see one full moon per month. About every two to three years on average, we see a "Blue Moon" — a second full moon in one month. 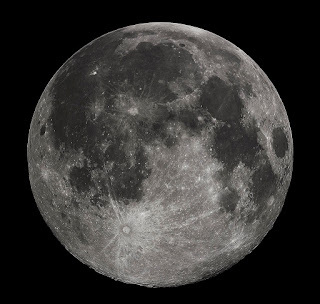 One effect of having a full moon on Jan. 31 and March 1 is that February has no full moon at all. February is the only month in which this can happen, because the month has only 28 days (while the phenomenon can happen in a leap year, it is rare). 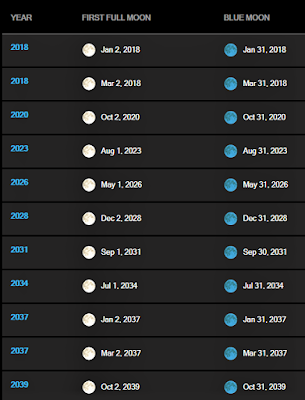 The next time a full moon will skip February will be in 2037, according to TheSkyscrapers.org, a site run by amateur astronomers, and the phenomenon is sometimes referred to as a "Black Moon." The next full moon will be a Blue Moon — the second full moon of January — on Wednesday, Jan. 31. To casual observers, the moon will still appear full the day prior and after the peak. 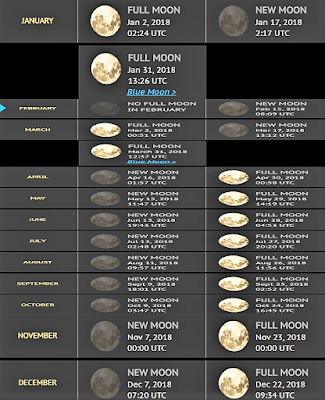 Like January's first full moon, the second full moon will be a "supermoon" as the moon arrives at perigee close to reaching its fullest phase. There will also be a total lunar eclipse during the Blue Moon, which some are billing as a rare Super Blue-Blood Moon Lunar Eclipse. Such a Blue Moon total lunar eclipse has not occurred for 152 years, our skywatching columnist Joe Rao has found. The full moon is the lunar phase when the Moon appears fully illuminated from Earth's perspective. This occurs when Earth is located directly between the Sun and the Moon (more exactly, when the ecliptic longitudes of the Sun and Moon differ by 180°). This means that the lunar hemisphere facing Earth – the near side – is completely sunlit and appears as a circular disk, while the far side is dark. The full moon occurs once roughly every month. When the Moon moves into Earth's shadow, a lunar eclipse occurs, during which all or part of the Moon's face may appear reddish due to the Rayleigh scattering of blue wavelengths and the refraction of sunlight through Earth's atmosphere. Lunar eclipses happen only during full moon and around points on its orbit where the satellite may pass through the planet's shadow. A lunar eclipses does not occur every month because the Moon's orbit is inclined 5.14° to the ecliptic plane; thus, the Moon usually passes north or south of Earth's shadow, which is mostly restricted to this plane of reference. Lunar eclipses happen only when the full moon occurs around either node of its orbit (ascending or descending). Therefore, a lunar eclipse occurs approximately every 6 months and often 2 weeks before or after a solar eclipse, which occurs during new moon around the opposite node. Full Moon - The moon is full when the moon is on the opposite side of the Earth from the Sun. Another way to look at it is that the moon, sun and earth are in a line with the earth being between the sun and moon. When this occurs the entire surface of the moon looks to be illuminated. The full moon occurs every 29.53058 days. New Moon - A new moon occurs when the moon is between the earth and the sun. We are seeing the oposite side of the moon that the sun is shinning on. At the exact time of the New moon the moon is to close to the sun to see at all. Blue Moon - Today we consider the Blue Moon to be when a full moon occurs twice in one month. This is a relatively new concept for the term. Originaly a blue moon was considered to be when a full moon occured 4 times in a season. 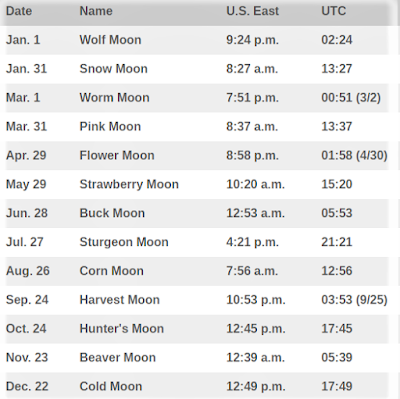 A season usualy has 3 full moons. The term has became popular when referring to any rare event. Super Moon - A new or full moon which occurs with the Moon at or near (within 90% of) its closest approach to Earth in a given orbit (perigee). In short, Earth, Moon and Sun are all in a line, with Moon in its nearest approach to Earth. 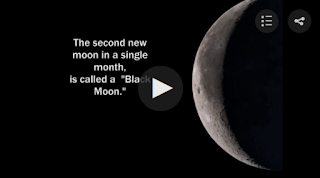 Black Moon - This is a term that is not used frequently and has no exact definition. Some sources use this term when there are 2 new moons in one month similar to the blue moon which is 2 full moons in a month. It is also the term used when there is no full moon in a month. Having a month with no full moon is very rare. It can only happen in the month of February since is has fewer days then the full moon cycle of 29.53058 days. A "Blue Moon" is a fairly infrequent phenomenon involving the appearance of an additional full moon within a given period. But which period — there are two definitions of the term, and one was borne out of a misunderstanding of the other. The other meaning is that a Blue Moon is the second full moon within a single calendar month. This definition — a "monthly Blue Moon" — has gained popularity in recent years because of a misinterpretation of an almanac's original definition. According to Space.com skywatching columnist Joe Rao, Black Moons (under this definition) occur about every 32 months. The next Black Moon in North America will be Friday, Sept. 30. Berman added that there are other definitions of a Black Moon. One refers to a situation in which there are no new moons in an entire month. This is only possible during the month of February, which normally has 28 days. Because a lunar cycle is 29.5 days, it's possible for February to miss either a full moon or a new moon. Chinese calendar, a lunisolar calendar, is formed on the movement of the moon. Full Moon occurs on every 15th Day of the Chinese Lunar Calendar. 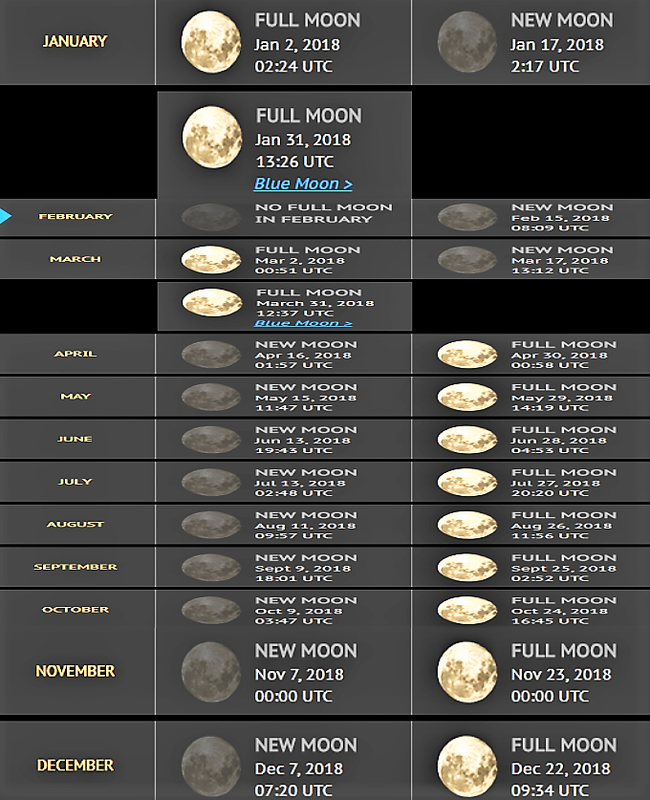 There are 2 Full Moons in January & March but no Full Moon in February 2018. Good Friday, the day on which Christians commemorate the death of Jesus Christ on the Cross, falls on a different date each year. It is the day on which Jesus Christ, having been betrayed by Judas and sentenced to death by Pontius Pilate, was crucified for the sins of mankind. From the earliest days of Christianity, no Mass has been celebrated on Good Friday, since the Mass is a celebration both of the sacrifice of Christ on the Cross and of His Resurrection. Instead, the Church celebrates a special liturgy in which the account of the Passion according to the Gospel of John is read, a series of intercessory prayers (prayers for special intentions) are offered, and the faithful venerate the Cross by coming forward and kissing it. The Good Friday liturgy concludes with the distribution of Holy Communion. Since there was no Mass, Hosts that were reserved from the Mass of the Lord's Supper on Holy Thursday are distributed instead. 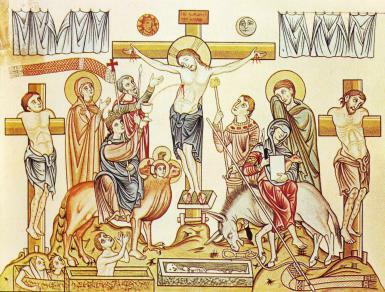 The service on Good Friday is particularly solemn; the organ is not played, and all vestments are red or (in the Traditional Latin Mass) black. 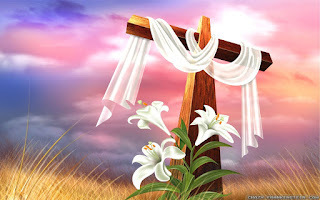 Since the date of Good Friday is dependent on the date of Easter, it changes from year to year. In June 2017 the Japanese government suddenly reversed its original position on China’s Belt and Road Initiative (BRI) and announced that Japan would cooperate and provide financial backing for the US$1 trillion cross-border infrastructure development project. Engaging with the BRI allows Tokyo to pursue some of its important economic goals through greater overseas infrastructure investment. The Initiative may also motivate Japanese companies to seek greater business opportunities along the BRI route. 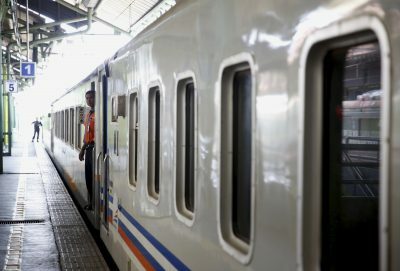 Japan’s own regional connectivity projects can complement the BRI and strengthen regional integration in the Indo-Pacific. 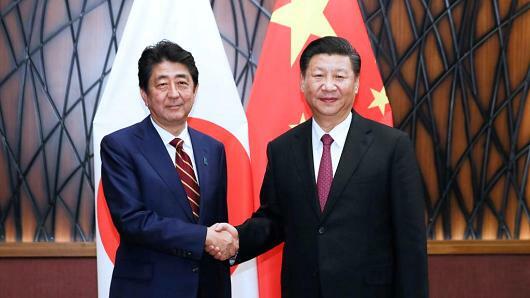 Japan’s support for the BRI is likely to enhance the efficiency of both China and Japan’s ongoing infrastructure projects due to their overlapping functional areas like energy conservation, the advancement of industry and the distribution of goods. There is huge potential for cooperation between Tokyo and Beijing to help deliver more rapid and sustainable growth given the region’s high demand for infrastructure. 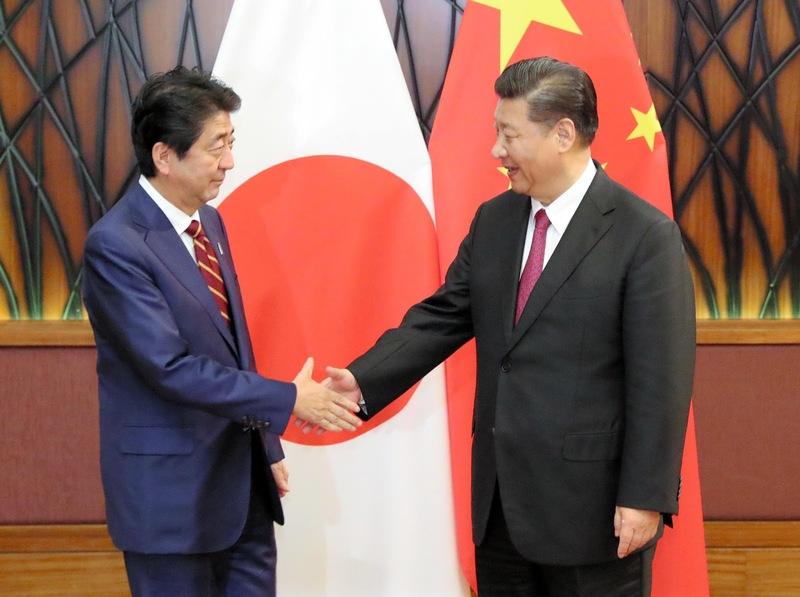 Japan and China may also be able to use this opportunity to improve their bilateral relationship, including by resuming high-level visits and winding down existing tensions in the East and South China Seas. 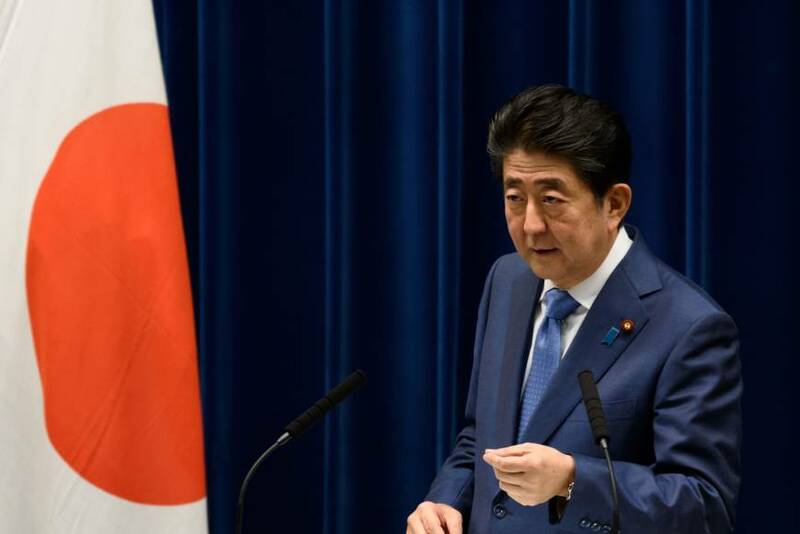 Prime Minister Shinzo Abe plans to promote cooperation in China’s cross-border infrastructure development project, in a shift in diplomatic policy to check Beijing’s growing territorial assertiveness in the region, government sources said Sunday. The Japanese government has briefed China on Abe’s current goal of promoting a free and open Indo-Pacific region and the policy’s positive effects on Beijing’s so-called One Belt, One Road cross-border infrastructure initiative, according to the sources. The Japanese government plans to cooperate with China on its Belt and Road initiative by financially supporting private-sector partnerships, as Tokyo seeks to improve bilateral ties with its Asian neighbour, the Nikkei reported on Wednesday. Japan’s reluctance to join China’s “Belt and Road Initiative” was always puzzling. Geopolitical concerns are one matter, but the economic gains and benefits from the planned infrastructure projects between Asia, Africa and Europe could not be ignored. 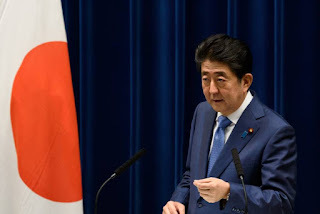 Japanese Prime Minister Shinzo Abe’s expressed intention to cooperate is welcome. The United States and India would also do well to follow his lead. Japanese business leaders and corporations have always been eager to join the scheme, but were disadvantaged by their government’s refusal to get on board. More than 100 nations and international organisations have backed the belt and road idea since it was first raised by President Xi Jinping in 2013 and dozens have signed cooperation agreements with Beijing under the framework. There is a widespread recognition of the opportunities offered by the initiative and the growth and prosperity that it can bring to the world’s most economically promising regions. Abe’s putting politics ahead of all else was cutting his country off from the benefits and potential gains. Worse, Abe seemed intent on forming a rival scheme with the US, India and Australia, a grouping informally known as the quad. Reflecting outdated thinking harking back to the cold war, the stated aim was to counter China’s growing influence in the region through isolation. The strategy was raised and promoted during US President Donald Trump’s visit to East Asia last month. 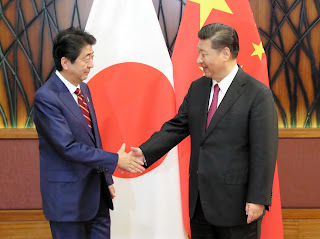 But Abe’s positive remarks about cooperation with China at a business forum in Tokyo earlier this month attended by Chinese and Japanese executives shows realisation that when it comes to trade and investment, such an approach is not in the interests of his country. The Asian Infrastructure Investment Bank (AIIB) was established under the leadership of China for the purpose of putting into reality the country’s economic vision of One Belt, One Road. Prime Minister Shinzo Abe’s administration has been consistently skeptical about the AIIB, pointing to the lack of transparency in its management and financing, as well as other issues. 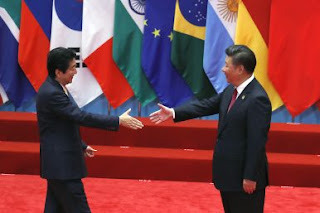 Even Vietnam and the Philippines, who are in a harsh territorial conflict with China in the South China Sea, joined the AIIB along with European powers; but Japan, keeping in step with the US, has chosen to stay out. However, given Japan’s position in Asia, its continuous dismissive attitude to the One Belt, One Road initiative may hurt the country’s economic interests and even diminish its presence as a major power in the region. In fact, from an economic standpoint, it makes more sense for Japan to welcome One Belt, One Road. The reason why the Japanese government has failed to do so lies in its strained relationship with China. Japan has been suffering from an economic depression for a long time. In contrast, China, despite the shadows cast on its growth these days, has already grown to become the world’s second largest economic superpower, and its military presence is also increasing. Consequently, the Japanese are starting to doubt the sense of superiority they felt over China for many years after the end of World War II. The antagonism over the perception of history, the Senkaku Islands, and other issues cannot be ignored, either. According to the “Survey of Public Opinion on Foreign Relations” released by the Cabinet Office on 12 March 2016, the percentage of respondents who had “no positive feelings” toward China recorded the highest value since 1978: 83.2 percent. Has Japan, a staunch supporter of the U.S.-led, universal value-based international order, embraced China’s Belt and Road Initiative (BRI)? Since the Belt and Road Forum (BRF) in 2017, in what may appear to be a sudden shift, traditional U.S. ally Japan has been embracing the BRI, which is often understood as Beijing’s grand strategy to employ every component of national strength to assert its influence and redesign the regional order. But a closer look at Japan’s strategy suggests Prime Minister Shinzo Abe is involved in a carefully considered attempt to discard a narrow approach — pursued in the case of the Asian Infrastructure Investment Bank (AIIB) — and engage with China with the objective of shaping it as a responsible actor and upholding the highest standards of global governance in accordance with international norms. As Beijing is becoming increasingly confident of its national power, it is pursuing geopolitical and geoeconomic interests through grand designs like the BRI. The BRI is an important instrument to realize President Xi Jinping’s goal of making China a “global leader in terms of composite national strength and international influence” by the middle of the 21st century. As Xi pursues the Chinese Dream under the narrative of “the great rejuvenation of the Chinese nation,” Beijing is increasingly putting the U.S.-led, universal value-based order to test. Whether it is designing a new regional security architecture marked by an “Asia for Asians” approach, testing U.S. resolve in the South China Sea, effectively employing “institutional statecraft” by designing alternatives like the AIIB, or leading regional economic architecture with the Regional Comprehensive Economic Partnership (RCEP), China is putting the U.S. role to the test. While traditionally a U.S.-led liberal order dominated East Asia, the arrival of China as a major power is altering the regional balance of power. As the debate around the future of the U.S.-led regional order intensifies, traditional allies like Japan have stepped up to reinforce the foundations and resilience of the U.S.-led system. The initial articulation of this was witnessed in Shinzo Abe’s strategic vision, culminating in Japan’s Free and Open Indo-Pacific Strategy in 2016. The Asia-Africa Growth Corridor (AAGC), conceived in collaboration with India, is one of the key manifestations of this strategy. 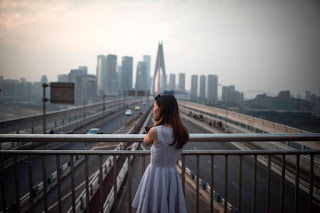 When Chinese president, Xi Jinping, unveiled what some call the most ambitious development plan in history, Zhou Jun decided almost immediately he should head for the hills. The 45-year-old entrepreneur packed his bags and set off for one of his country’s most staggeringly beautiful corners: a sleepy, high-altitude border outpost called Tashkurgan that - at almost 5,000km (3,100 miles) from Beijing - is the most westerly settlement in China. “I saw a great opportunity to turn this little town into a mid-sized city,” Zhou explained during a tour of ‘Europa Manor’, a garish roadside spa he recently opened for Chinese tourists along the Karakoram, the legendary 1,300km highway that snakes through China’s rugged western mountains towards the 4,700m-high Khunjerab Pass. A huge shift in trade and relations could be under way across Eurasia and China's New Silk Road policy is at the heart of it. 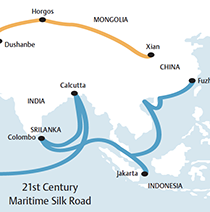 As a historical reference point, the Silk Road continues to resonate, long after the trade route serve ant economic purpose. For Europe it evokes the slow sway of camel trains across parched landscapes and the flow of exotic goods into the continent. And in China, it brings to mind the touchstones of its imperial history and its connection to the outside world. LET'S NOT BEAT around the bush. PM Lee Hsien Loong's absence at the New Silk Road summit currently taking place in China is a big deal. Was he not invited or did he elect not to attend (and despatched National Development Minister Lawrence Wong instead)? The former seems the more plausible account. Either way, the development can only be described as doomy. 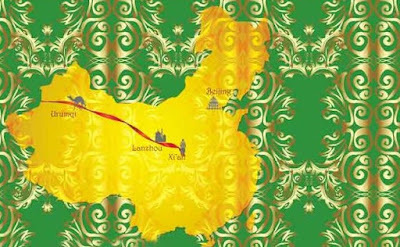 Belt and Road Initiative -- idea from China but belongs to whole world. The Belt and Road (yidaiyilu) Initiative has become the most popular public goods and platform for international cooperation with the brightest prospects in the world amid rising protectionism and unilateralism, Chinese Foreign Minister Wang Yi said on the sideline of the recently concluded China's two sessions. Proposed in 2013 by Chinese President Xi Jinping, the initiative has witnessed continuous expansion of its "friend circle", and yield tangible benefits for countries along its routes. It will provide unprecedented opportunities for the economic and social development of countries involved, as "it is the way leading to the community of shared future for mankind," said Gerrishon K. Ikiara, a senior lecturer at the University of Nairobi. 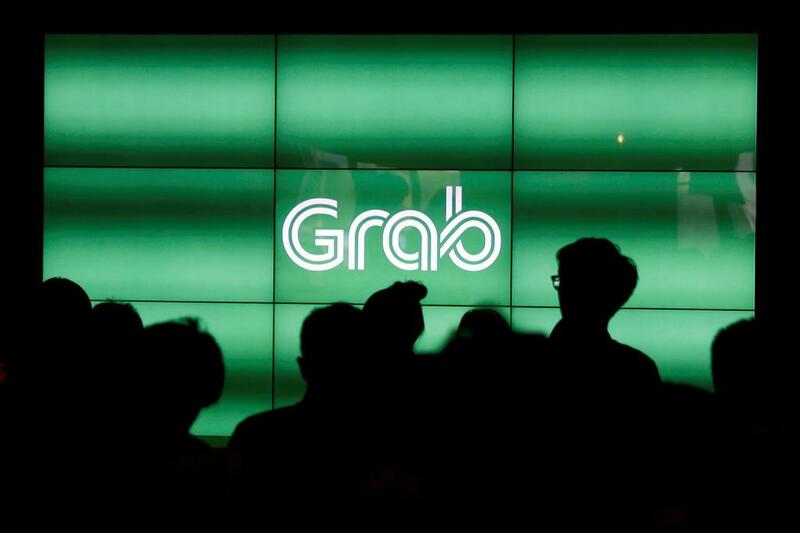 Grab has acquired Uber’s Southeast Asia operations. According to an announcement, in exchange, Uber will take a 27.5% stake in Grab & Uber CEO Dara Khosrowshahi will join Grab’s board. Moreover, Grab is now backed by DiDi Chuxing & Uber, in addition to leading global investor SoftBank. Singapore-based Grab, Southeast Asia’s biggest ride-sharing company, snapped up main rival Uber’s business in the region, promising better services through its enlarged network. 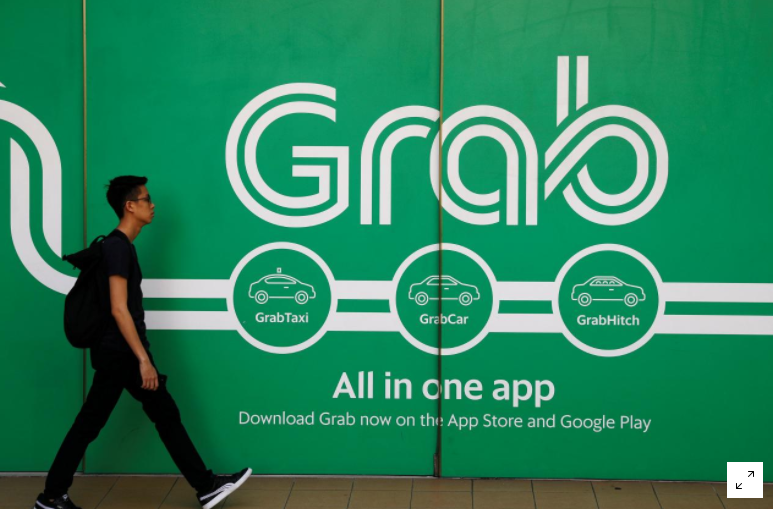 Grab announced Monday it would take over Uber’s operations and assets in the Philippines, Cambodia, Indonesia, Malaysia, Myanmar, Singapore, Thailand & Vietnam, ending months of speculation. In exchange, California-based Uber will get a 27.5% stake in the combined business—a move seen to cut Uber’s massive losses as it prepares to go public next year. Grab said the figure reflected Uber’s market share in the region. As an Uber driver, it came as a shock to me that Uber was sold to Grab (“Grab, Uber SEA confirm merger, with Uber taking 27.5% stake in Grab”; March 26). Many of us private-hire car drivers are with Grab and Uber because they both have their own advantages. With the acquisition, I worry that many consumer and driver benefits will be lost. Many people think that drivers just want more income through surge pricing or the payment incentives in providing ride-hailing services. However, this is not often the case. The non-financial benefits are important as well. 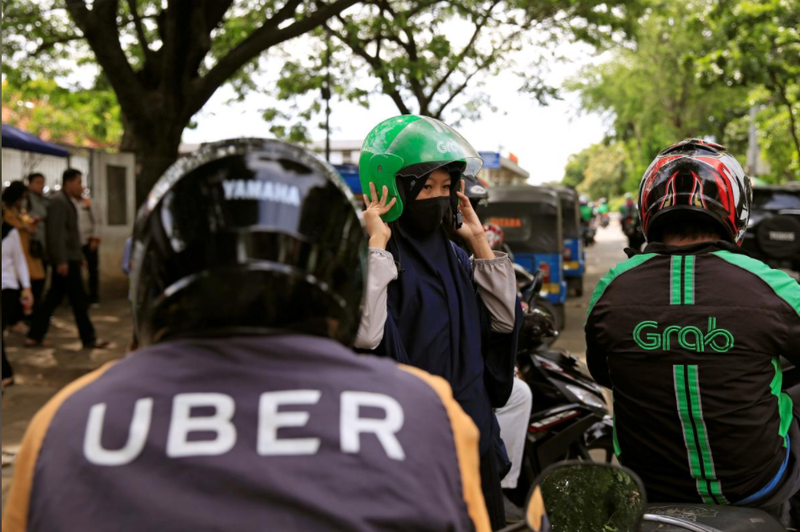 Uber will sell its business in Southeast Asia to a local competitor, Grab, the ride-hailing company has announced, in a deal that experts say is designed to position Uber for an initial public offering next year. 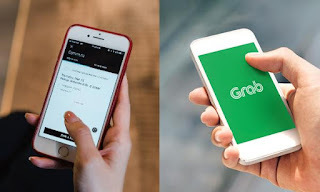 Grab will purchase Uber's ride-hailing and food delivery operations in the region in a deal valued at several billion dollars, according to a person familiar with the acquisition who spoke on the condition of anonymity because they were not authorised to speak publicly. Uber will receive a 27.5 per cent stake in the Singapore-based Grab, and chief executive Dara Khosrowshahi will join Grab's board, the companies said. Uber's sale in Southeast Asia, where Grab claims 5 million daily users, follows several strategic deals in competitive international markets. Yandax, a Russian rival, merged with Uber last year in a deal valued at US $3.7 billion. And in 2016, Uber sold off its local operations to the dominant Chinese ride sharing service, Didi Chuxing. 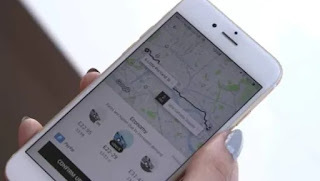 Like the prior transactions, the deals free Uber to invest in other, more lucrative markets, while granting the company a stake in their competitors' expanding businesses, experts say. Not too long ago, new, improved Uber CEO Dara Khosrowshahi bemoaned his company’s massive hemorrhaging of cash and vowed to “get the love back” and restore Uber as a beloved brand. As an Uber/Lyft driver, all I can say is good f—ing luck with that. Here’s a news flash: Uber is bound to fail. And so is Lyft, Uber’s little sibling with better PR. The sooner we all understand this, the better. 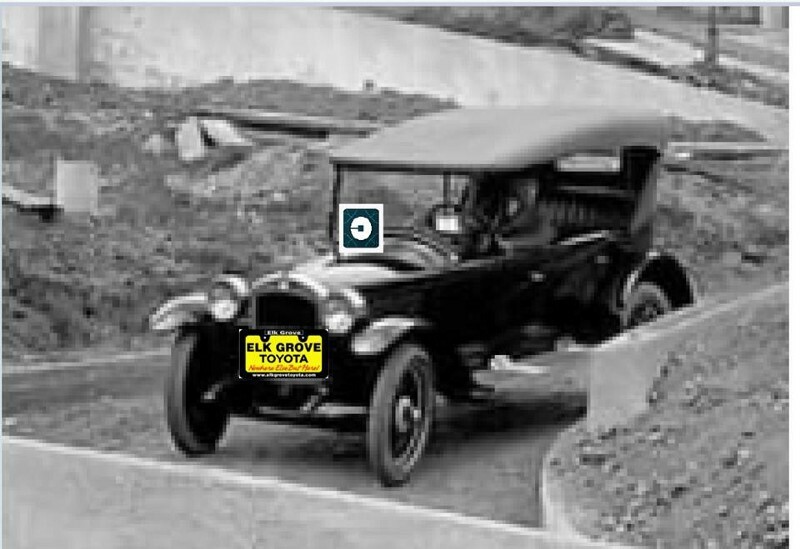 Uber calls itself a “technology” company instead of a taxi company. This is because unlike a traditional cab company, for which you use your phone to call for a cab, you use your phone to call for a cab. See? The difference is obvious. Uber/Lyft’s business model is to lose money for years or decades to grow its market and then, suddenly, replace all its human drivers with robots. And then we’ll all be rich, because volume. How’s that working for you, fellas? Oh, Uber has lost more money than any start-up in human history? What? How can this be?! Uber makes so much money! Look at all the Uber/Lyft cars clogging our streets! We use it so much! How could it not be profitable? The short answer is that they don’t charge enough. Uber’s rates in most of the USA are less than $1 a mile and 10 cents a minute. How long ago were taximeter rates that low? Well, that depends if you want to correct for inflation or not. For New York City taxi rates (which are roughly similar to SF’s) to get that low in non-adjusted dollars, you’d have to set your way-back machine to 1980, when you could rent a three-bedroom apartment for under $500 a month. In Nob Hill. 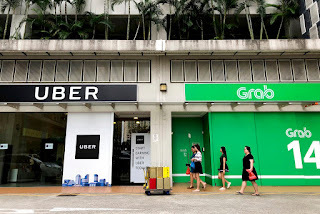 A mix of concern and disappointment met Uber Technologies Inc’s [UBER.UL] deal to sell its Southeast Asian business to bigger regional rival Grab, as drivers and users of the ride-hailing firms took in the prospect of sharply reduced competition. Grab said the Uber acquisition accelerated its path to profitability in its core transport business, as it would become the most cost-efficient Southeast Asian platform. While drivers were split on which of the two services offered better compensation, they generally expected fares to go up with the reduced competition. 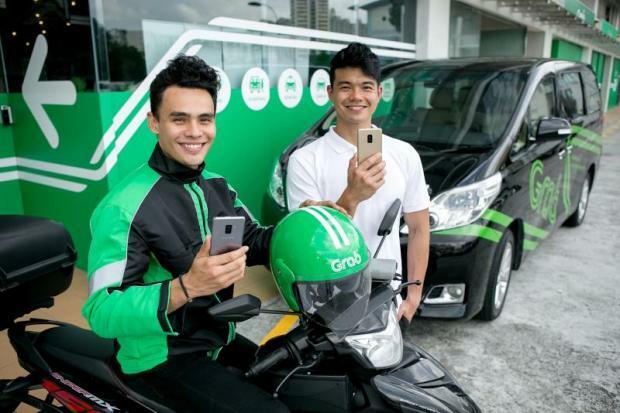 In a move that its founder described as “the beginning of a new era”, Singapore-based Grab confirmed on Monday (Mar 26) that it will be taking over the Southeast Asia operations of its arch-rival Uber at an undisclosed sum. 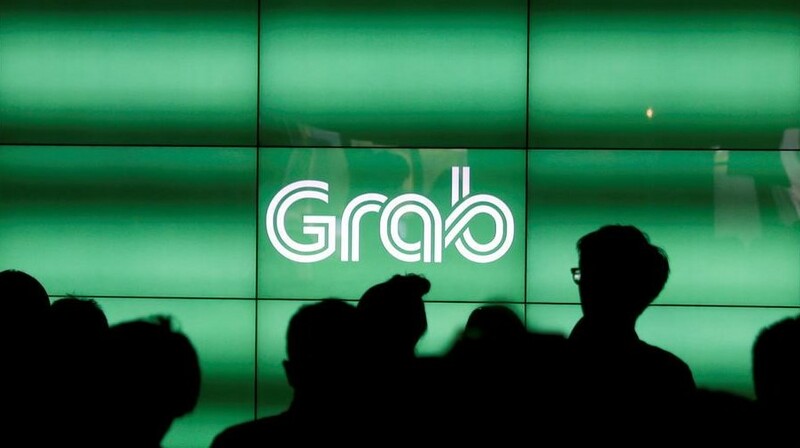 With the acquisition, Grab will take over Uber's operations & assets in 8 Southeast Asian countries. It will be integrating Uber’s ride-sharing and food delivery business in the region into its platform. In exchange, Uber will take a 27.5% stake in Grab and Uber CEO Dara Khosrowshahi will join Grab's board. Grab’s acquisition of U.S. ride-hailing firm Uber Technologies Inc’s [UBER.UL] Southeast Asian business was driven independently by the two companies, and was supported by their common investor, Japan’s SoftBank Group (9984.T), a top executive at the Singapore-based firm said. “It was really a very independent decision by both companies. SoftBank, of course, and Masa in particular, was highly supportive of the acquisition,” Grab President Ming Maa told Reuters, referring to SoftBank CEO Masayoshi Son. The deal was in the “best interest of both of the companies”, he added. The deal marks Uber’s second retreat from an Asian market and will see the firm take a 27.5 percent stake in Grab. 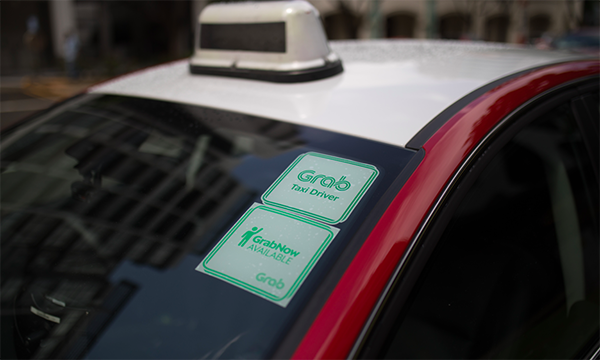 Consumers & industry watchers are raising concerns that ride-hailing firm Grab's acquisition of rival Uber's South-east Asian business will reduce competition & lead to higher fares. Ms Zhang Bin Bin, who takes both Grab and Uber rides, is unsure how fares will change now that "competition is minimised". "If prices increase or if they match regular taxi prices, I will probably go back to public transport," said the film-maker, 23. Taxi operator ComfortDelGro and Uber announced on Friday (Dec 8) that they have entered into a strategic agreement to form a joint venture. 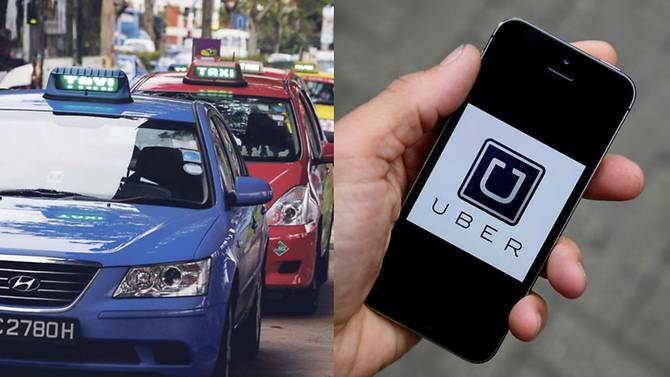 Under the agreement, which is subject to regulatory approval, ComfortDelGro will acquire a 51% stake in Uber’s wholly-owned car rental subsidiary in Singapore, Lion City Holdings, the 2 parties said in a joint media release. The latter, in turn, operates Lion City Rentals which has a fleet of about 14,000 vehicles. Uber will retain the remaining 49%. 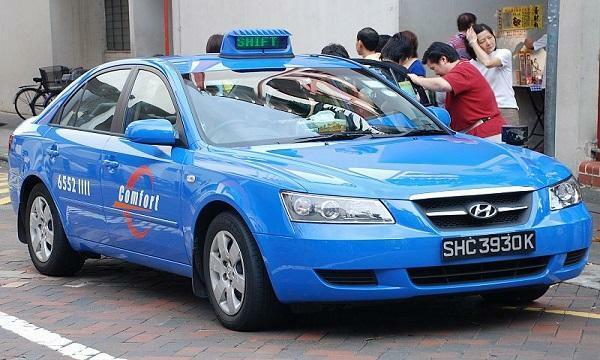 Valued at about S$642 million, with a cash consideration of S$295 million, it ranks as ComfortDelGro’s single largest deal to-date. 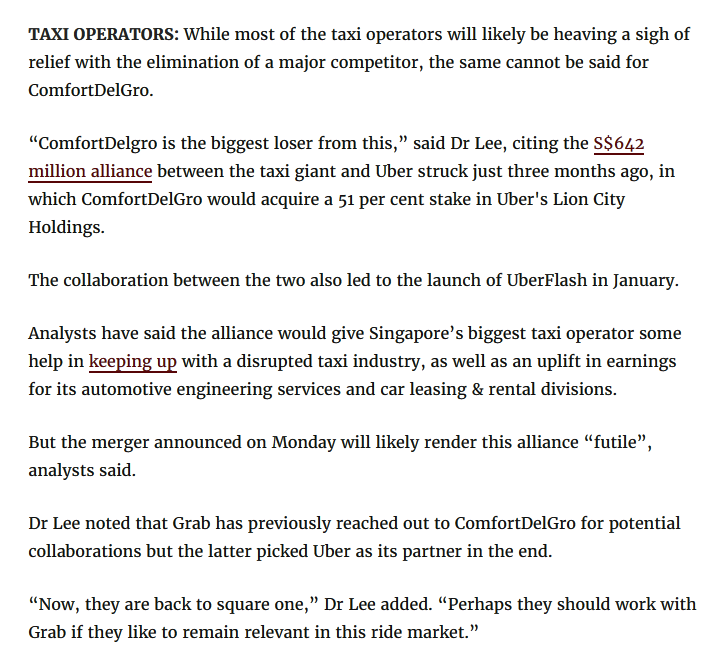 related: How will the Grab-Uber deal affect ComfortDelGro? 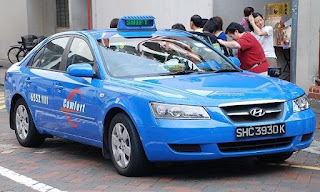 While most of the taxi operators will likely be heaving a sigh of relief with the elimination of a major competitor, the same cannot be said for ComfortDelGro. 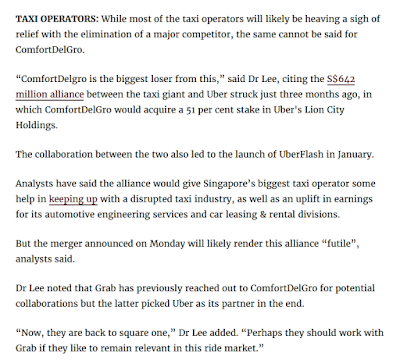 “ComfortDelgro is the biggest loser from this,” said Dr Lee, citing the S$642 million alliance between the taxi giant and Uber struck just 3 months ago, in which ComfortDelGro would acquire a 51% stake in Uber's Lion City Holdings. The collaboration between the two also led to the launch of UberFlash in January. 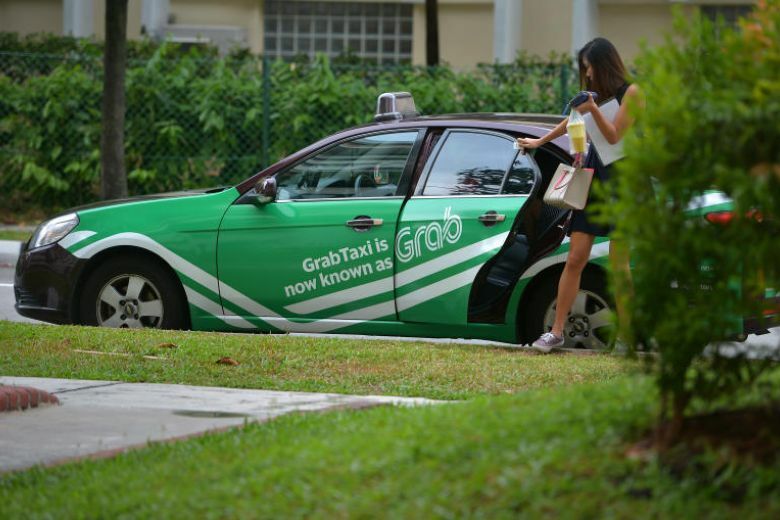 Analysts have said the alliance would give Singapore’s biggest taxi operator some help in keeping up with a disrupted taxi industry, as well as an uplift in earnings for its automotive engineering services and car leasing & rental divisions. But the merger announced on Monday will likely render this alliance “futile”, analysts said. The proposed $642m acquisition of LCR might be renegotiated. As Grab assumes control over Uber’s Southeast Asian operations, ComfortDelGro is left in limbo amidst its proposed tie-up with the defeated ride-sharing giant. On December, CD announced it was cooperating with Uber for a proposed acquisition of 51% of the Lion City Rental for $642m. 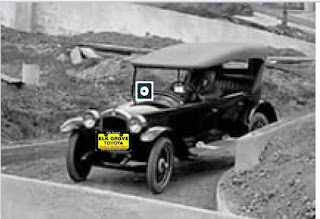 This move launched the UberFlash service which matched riders with the nearest CD/UberX vehicle. However, with Grab’s acquisition of Uber’s ride-sharing business, the terms & conditions of the deal could be renegotiated so that CD can continue to partner LCR with Grab, according to CIMB. 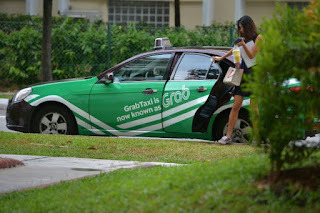 Grab is acquiring Uber's ride-sharing and food delivery businesses in Southeast Asia and integrating them into its transport and fintech platform. 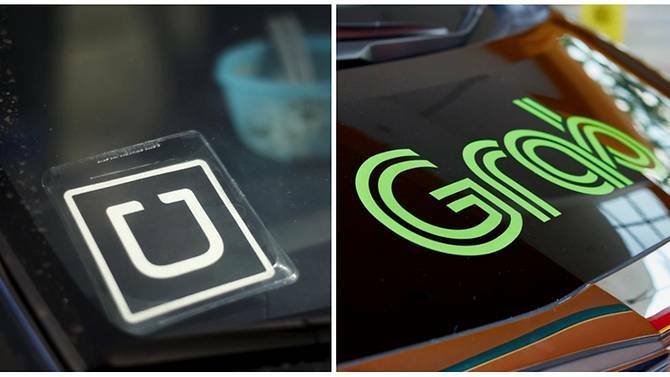 The merger between Grab and Uber is driving market concentration to monopoly levels, underlying the urgency of regulations that legalise and keep in check ride-sharing service in Thailand, say industry. Sumet Ongkittikul, research director for transport and logistics policy at the Thailand Development Research Institute (TDRI), said the consolidation of ride-hailing firms in Southeast Asia might increase. Regulators need to take steps to protect consumers, legalise the service and implement anti-dumping laws, he said. Analysts believe that being in a monopolistic position, Grab can change fare structures in order to improve profitability. After Grab's acquisition of Uber's Southeast Asian operations, CEO Dara Khosrowshahi wrote to employees that consolidation will no longer be a strategy for the company after it also bowed out of the markets in China & Russia, and most recently in Southeast Asia. 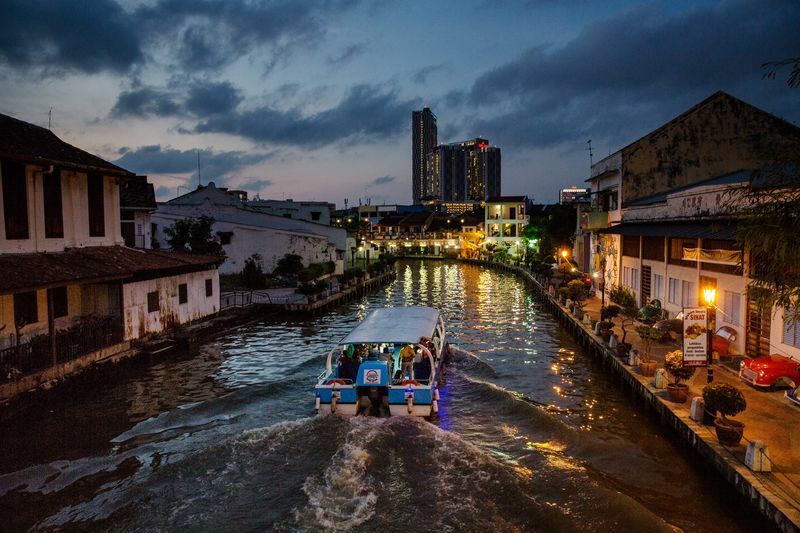 Grab buys Uber's SEAsia operations: Who are the winners and losers? Will Uber exit Hong Kong market? Is the Rise of Healthcare Cost Unsustainable?